At the library recently K picked out a book we really like: The Art of Miss Chew. This book is about a girl, Patricia, who is really talented with art. She discovers a love for it while staying with her grandmother one summer. Her school doesn’t have much of an art program, but she is so talented her teacher recommends her for a special art program in her school system, taught by Miss Chew. One thing I love about this book is the words ‘learning disability’ are never used. Patricia has had problems reading in the past and she still reads too slowly to finish a test, but it’s never called a disability. 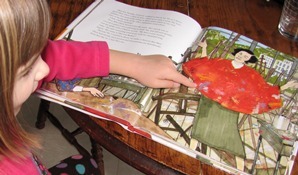 Her art teacher and a reading specialist explain the way she reads in art terms rather than calling it a disability; it’s just another way Patricia sees the world. Another great aspect of the book is the art. It has beautiful pictures. A few art concepts are described in the story, such as negative space and seeing the world through artists’ eyes. It reminded me to ‘see’ some of the details of the world and help my kids do the same. Plus, a side story in the book is Patricia’s relationship with her regular teacher, Mr. Donovan. Patricia paints a beautiful picture of Mr. Donovan’s father and I can hardly read the last page of the book without crying.